This post is sponsored by HERSHEY's and Global Influence. Thank you for supporting our family and blog by enjoying these cupcakes! Can you smell that? Spring is in the air! Winter is always rough at our house. Lots of illnesses and this mommy isn't particularly a fan of snow. So when spring starts to hint that it's on the way, I get excited! I always feel like once we reach Easter, we have officially left winter far behind. Back in October, HERSHEY'S asked if I would create something with their candy for Halloween. Last month, they came back and asked if I would create something else to celebrate Easter and the coming spring. 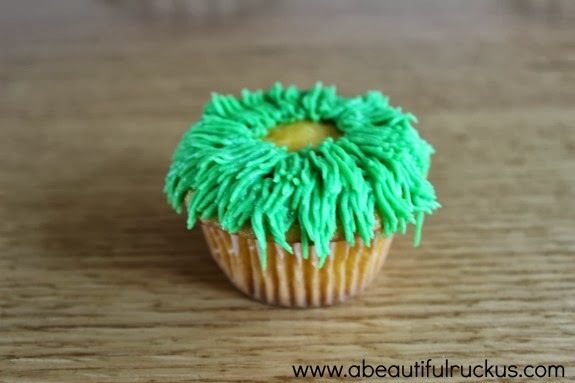 I decided to make a bird's nest nestled in grass on a cupcake. I think the bird's nest perfectly represents spring and what Easter means. As a Christian, Easter is an important day for me because it is the day that Jesus gave His life, so that I could be saved and have a new life through Him. The eggs represent new life that we celebrate on Easter. 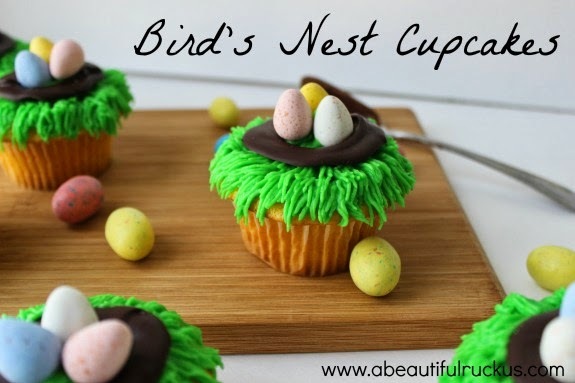 Hopefully, you follow the logic behind my Easter/Spring Bird's Nest Cupcakes! First of all, mix up a batch of your favorite cupcakes. I went with a lemon cupcake because I love citrus flavored goods in the spring/summer. But you can also just grab a box mix from the store if that's more your speed. No judgement here! While those are baking, we are going to start working on our bird's nests. In a heat-proof bowl, microwave the HERSHEY'S Chocolate Chips, stirring every 30 seconds until melted. 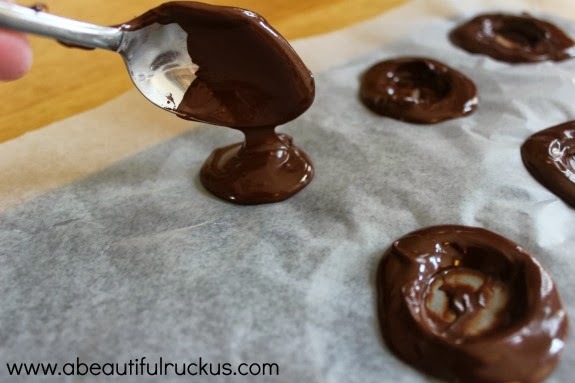 Take a spoon, and drop about 2 teaspoons of melted chocolate on wax paper. Working quickly, use the tip of the spoon to create a well in the middle of the chocolate. Don't worry about making sure there is chocolate on the bottom of your nest. The important part is making sure the chocolate builds up a bit on the sides. Once your nests are made, slide your tray into the refrigerator to set. Now, get your grass icing tip. I used a Wilton #233 tip for my cupcakes. 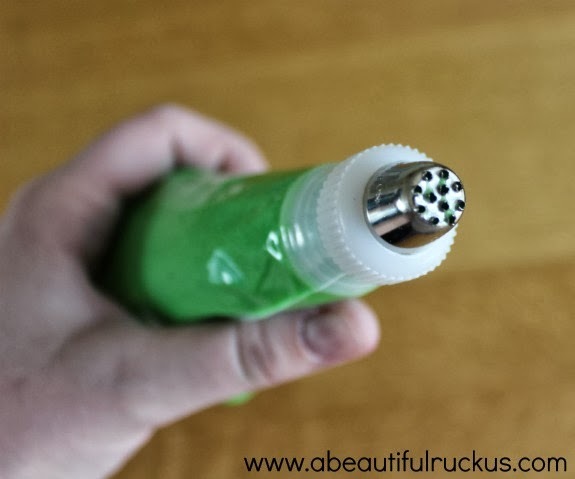 Place your green icing in a decorator's bag and attach the tip to it. 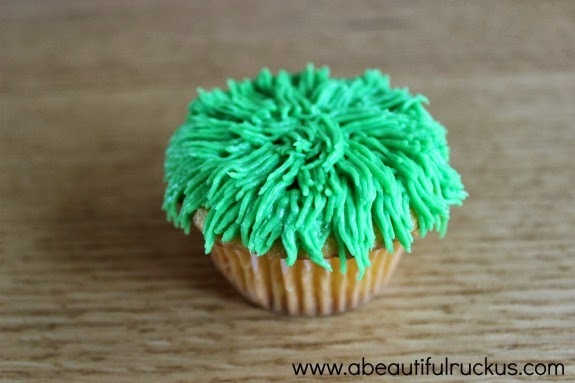 This is all you need to make a grassy cupcake. 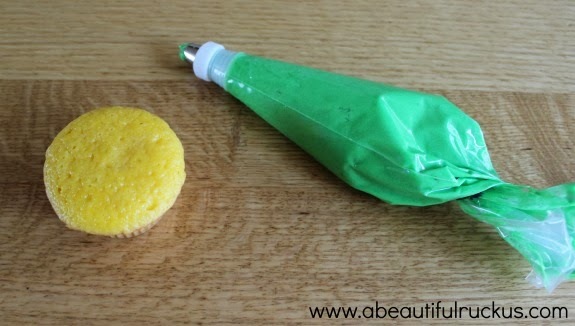 Start by pressing and releasing your decorator's bag to pipe a fringe of icing around the edge of your cupcake. Perfection isn't necessary. Just pipe away and have fun with it. If you notice a bare spot, just pipe right over it with more grass. Move in towards the center and pipe another layer of icing all the way around. And now, just pipe a few more blades of grass to cover the middle. Your bird's nest should be set by now. 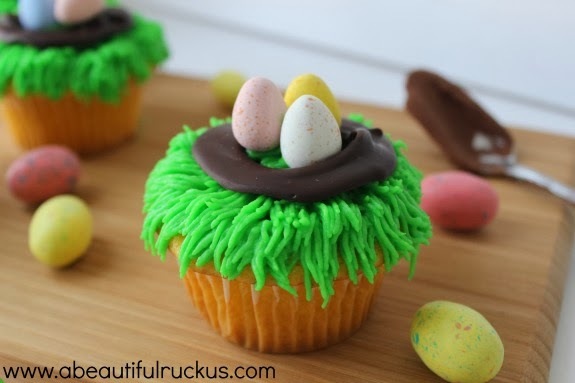 Place a nest on top of your cupcake. 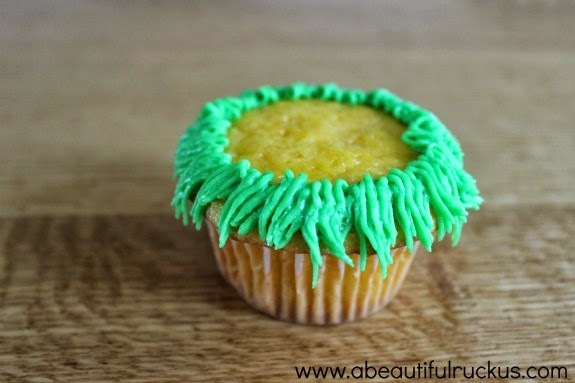 The fresh icing will act as a glue to hold your nest in place. Now add just enough icing to the center of the nest to "glue" your CADBURY Mini Eggs in place. I added three little eggs to center of each nest. And done! How easy and cute is that? Two Dozen Cupcakes - Your Choice of Flavor! 2. Using a heat-proof bowl, melt the HERSHEY'S chocolate chips in the microwave, stirring every 30 seconds until smooth. 3. 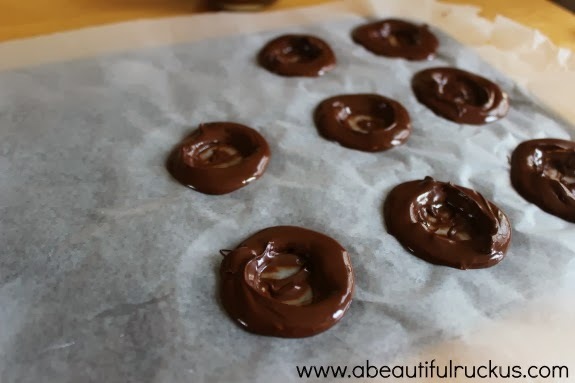 Drop 2-3 teaspoons of melted chocolate on wax paper. 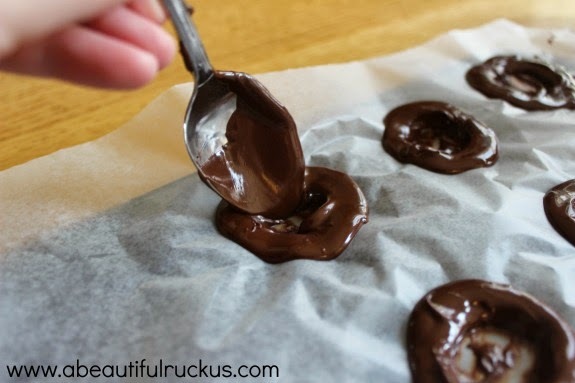 Using a spoon, create a well in the middle of each chocolate dollop. Place the completed bird's nests in the refrigerator to set. 4. 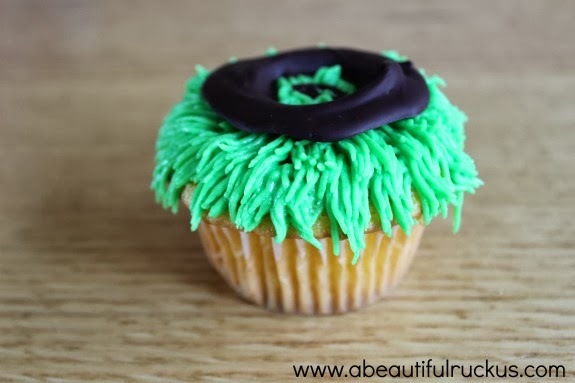 Using the grass tip, pipe grass in layers around each cupcake. Start from the outside edge and work your way toward the center. 5. 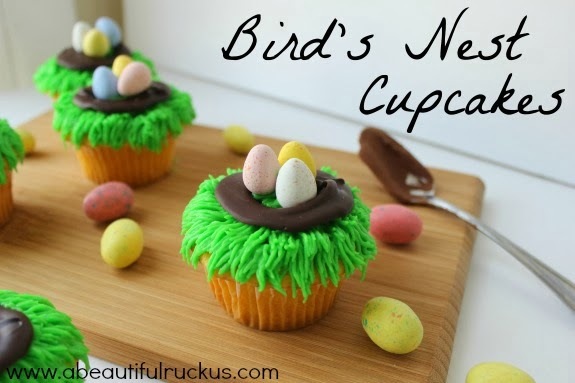 Place a set chocolate bird's nest in the middle of each cupcake. 6. Add a small amount of icing to the center of the bird's nest to act like "glue." Add three CADBURY Mini Eggs in each nest. If you need a quick and easy buttercream recipe, just beat two softened sticks of butter on low speed for 30 seconds until fluffy. Add one 2 lb bag of powdered sugar, 1/2 cup of milk, and 4 teaspoons of vanilla to your bowl, and whip until fluffy. Add food coloring until you have the color you want. If it seems a little thick, you can add extra milk in 1 Tbsp increments until you get your desired consistency. This batch make enough to ice 2 dozen cupcakes. If you need extra Easter dessert inspiration, make sure you check out the Celebrate with Hershey's website! Oh...and, hey! How would you like a fun HERSHEY'S surprise in the mail? HERSHEY'S is sending one of my readers a prize pack full of candy so that you can create your own Easter memories! Please use the Rafflecopter widget below to enter. Winning entries will be validated prior to announcing the winner with an alternate drawn if the entries cannot be verified. The contest ends at 11:59pm on Monday, March 17th. The winner(s) will be randomly chosen, contacted by email, and will have 48 hours to respond to the email with their information so that the prize can be forwarded to them. A Beautiful Ruckus is not responsible for the delivery of the prize and is not responsible if the sponsor does not deliver. This giveaway is open to residents of the United States. A Beautiful Ruckus was compensated for writing this sponsored post by HERSHEY'S and Global Influence, however all opinions are 100% original and authentic. For more info, please see my disclaimer page. Those are adorable, I just may try them! I also want to try the recipe from Hersey for the White Chip Apricot Oatmeal cookies, those sounds so good! My favorite Easter tradition is our church's large Easter service. For this day we combine all 6 of our services for one huge Easter celebration. Watching almost 2000 people worshipping Christ and celebrating His resurrection brings me so much JOY! Praise God for a reason to celebrate! Those are adorable! And you make them look easy to make. My girls love flowers, so I would like to try the Hershey's Flower Pot Bouquet. One of my favorite Easter traditions is making the Resurrection eggs with the kids and talking about each one. 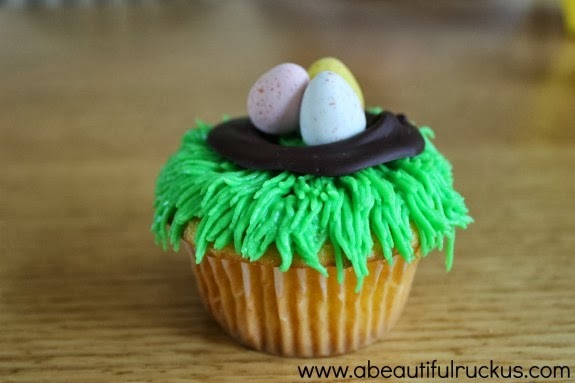 I like the Easter basket cupcakes on the site. My favorite tradition is hunting for Easter eggs. You always make things look so easy. You are a very talented young lady! I love the leftover Easter candy brownies idea, because, BROWNIES! My favorite Easter tradition is doing breakfast at church and the music and readings that replace our usual morning service. Having seen and eaten one of these I can say that they were super cute and delicious!! those are super cute. 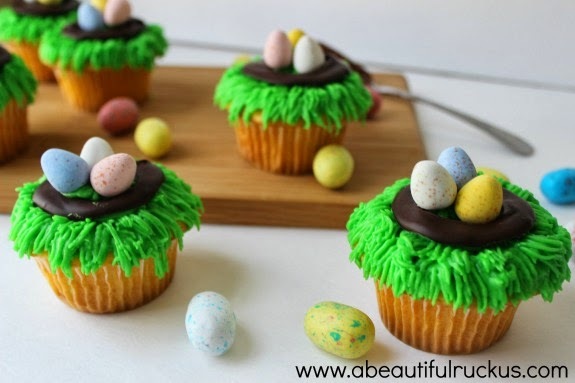 I may try and make those for Easter. Love these - they are super cute! 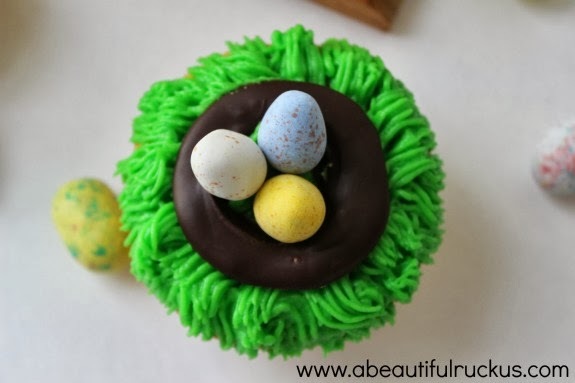 I make similar ones except I use the same #233 tip and pipe brown icing into a stringy brown nest on the top, and pop the eggs in the middle. Favorite Black-Eyed Susan Cheesecakes, love to spend it with my family. Oh, so much yummy food! I think that the chocolate mint dessert looks amazing. We've made something very similar and it was delicious! I'm going to make the Velvety Chocolate Cream Pie for my Easter Brunch this year. My favorite tradition is coloring Easter Eggs with the little ones. Silly question: Do they need to be refrigerated afterwards? I think the coconut marshmallow nests look awesome. We pass around a big wicker basket and everybody gets to choose until thegoods run out. I'd love to make the Chocolate Almond Macaroon Bars recipe! My favorite tradition is dyeing Easter eggs with my children!